As delightfully weird as ever, Primus delivers on all expectations, musically and lyrically. With Les Claypool leading the charge, slapping, strumming, tapping, and even parading his fingers over his bass fret board, these songs deliver a boscage of musical exploration from an angle that is fuzzy from all standards of normalcy. Lyrically, Primus is just as bizarre, bringing to light the almighty Salmon Man, a boys promise to live in his father's shadow. Erratically, presenting the Eternal Consumption Engine, a modern day critique of the consumers eternal desire to forever enter walmart and devour chinese merchandise. Primus often times gets reduced as a Les Claypool project. Which, for the most part is accurate. But the entire band shouldn't be casted to the shadows. They are some of the finest musicians making music in the industry. Drummer, Tim Alexander, taps and rapts on his high hat likely perfectly timed erratic tics that Les's characters are inevitably displaying. Primus divides listeners with either unquestioned appreciation and devotion, or to the other side of entire alienation. 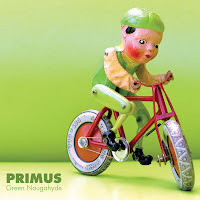 In no way is Primus trying to replicate already recorded material, nor are they trying to accomodate to the seasonally sensative, searching for a good ballad to touch your heart. Primus creates distinctively unique music, bending funk into ragged metal solos with heavy bass pedal thunder. A truly fun and unpredictable jam band with white trash lyrics and reckless precision. Green Naugahyde is a good expansion for any Primus library. And for those without Primus in their library, what better place to start.